Peruvian Mahogany Base attaches to the wall covering the floorings expansion gaps where the wall meets the floor surface. Coordinates with laminate flooring and moldings to provide a finished look to any room in your home. Base dimensions are 94 in. Length x 3-1/4 in. Width x 9/16 in. Height. Buy online Zamma Peruvian Mahogany 9/16 in. Thick x 3-1/4 in. Wide x 94 in. 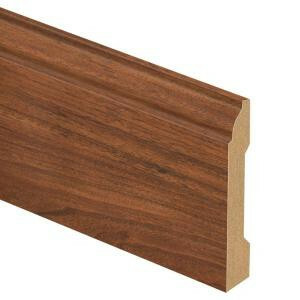 Length Laminate Base Molding 013041542, leave review and share Your friends.